Large Framed Peter Hayward Lithograph Print "Quiet City"
This is a lithograph printed on textured cardboard to give the illusion of a real painting. It’s no catastrophe. Nice Piece ! It reads: Paris Place De La Concorde Arno. All pricing is up front so you know exactly how much everything is! HAND PAINTED WATERCOLOR ON PAPER, NOT A PRINT OF ANY KIND. SIGNED ON REVERSE, PAINTED AT 1969 YEAR. I WILL WORK TO RESOLVE THIS ISSUE AS QUICKLY AS POSSIBLE. YOU ARE PROTECTED IN THE EVENT THIS OCCURS. Born in Berdichev, Zhitomir region. Studied at Kiev Art School 1950-54. He has graduated from Kyiv Institute of Art 1955-61. He was a student of V.Kostetski; V.Puzyrkov. His father has been shot during Stalin repressions. 2 Vintage Illinois Central New Orleans Prints New Orleans Al Mettel . Measures 11" X 13". Please see photo for details and ask any questions before bidding. Thank you! 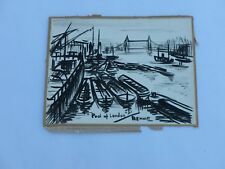 original painting by George Rennie of the "Pool of London"
We have a large eclectic collection of work. We are located in the foothills of the Blue Ridge Mountains at the northern end of the Shenandoah Valley. The East End Gallery. 1970’s era. Very good to excellent condition. (Right side). Oil on cardboard. Size: 29x21 cm (11 x 8 1/2 in). 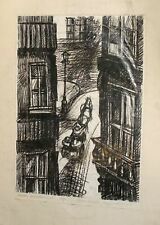 Artist: Listed Danish artist William Sorensen (1914-1968) - signed. Ready to hang. The painting is in good co ndition. (50 x 40 cm). (60 x 50 cm). Age:The work is from around 1960. Delays can occur du to custom and security check. ".Rather than capture urban settings in Paris, van Gogh preferred pastoral scenes, such as Montmartre and Asnières in the northwest suburbs. Of the two years in Paris, the work from 1886 often has the dark, somber tones of his early works from the Netherlands and Brussels. Vintage Mid Century Painting mounted in Wood Frame. Beautiful European City Street Scene. Artist Signed Lower Right Corner but Signature Not Legible. Painting Size 16" x 20". Frame Size 20" x 24". Painting has some Crazing in Thick Paint Areas. Canvas has Ripples or Wavy. This well-executed colorful painting captures the frenetic energy of a vibrant urban cityscape. Under a black light it shows no signs of paint loss, in-painting or repair. Vintage Ozz Franca Mid-Century print, "Forbidden City", giant 28" X 44"
This is not a real oil painting but is actually pretty cool on it's own. Well-painted oil on canvas of the Palais Garnier Opera House and outdoor markets in Paris by listed French artist Georges Gerbier (1906-1983). Known for his impressionist paintings of Paris, this is an excellent example of his work. We give the history of an object to the best of our abilities, but we may make mistakes. Please see photos for quality assessment Slight bend to the paper but will straighten out nicely when matted. I have a number of fabulous prints of Latin America in the 1950s or 1960s (my guess—they are undated). Other photos are signed J. McEwin but I can’t find info on him. The caption is taped on and if you remove it, it will likely damage the photo. Please ask if you have any questions! 10” x 8”. Antique Original oil painting Сityscape "Views of Azerbaijan". Artist Yanin A.A. Subscription work of the Ukrainian artist Yanin A.A., created in 1950-s. Сityscape "Views of Azerbaijan" - Original Oil painting on cardboard. All pictures are actual. You will receive the exact item shown in the picture. Well executed oil on canvas by Swedish artist Gösta Robert Frodig (signed Roberts) showing a bridge in Bern, Switzerland. Original Art Oil Painting by Listed Swedish Artist. The painting is ready to hang and I´m sure it will give great pleasure. Up for sale is this incredible painting of a charming French village by American artist Keith Ingermann. Signed and dated at the bottom. This is perhaps the most stunning example of Keith’s work that I’ve come across, and I’ve seen many. The detail is incredible. On the back can be found the original dealer’s mark from Hammer Galleries in NYC which sold Ingermann’s work as well as the original 1964 price tag of $1450. The frame has many chips and missing pieces, but I think this only adds to the charm. The artwork itself is in excellent condition. Image size of approximately 12.5”x15” framed to 17”x19.5. Shipping via FedEx. Payment due in 48 hours. Please feel free to contact me with any questions. Thanks for looking! This is a beautiful mid century cityscape. It depicts a bay full of boats against the backdrop of a city. The buildings have slight impasto technique and the colors throughout are gorgeous. This is a classic mid century piece. ORIGINAL BEAUTIFUL RUSSIAN PAINTING. Great Condition. R U S S I A N A R T.
Excellent oil on board by very well listed Swedish artist Knut Norman showing a cityscape in vivid colours. Very striking! KNUT NORMAN. Original Art Oil Painting by Listed Swedish Artist. The painting is ready to hang and I´m sure it will give great pleasure. Vintage Illinois Central RR Promo Prints New Orleans Al Mettel Set/4. Frames under glass. Written in left matting the name of the work and “courtesy Illinois Central System “ and on the right copyright symbol and artist signature. Scenes include St Louis Cathedral, Pirates Alley, The Pontalba Apartments and Courtyard if the Little Theatre. Three frames are in good vintage condition but one has much damage mostly at upper left. The frames have a lovely cut out down middle of each edge. Hopefully they are evident in the photos. Artist is Al Mettel. I am not sure of the age of the prints. Artist: Unindentified artist - signed Sv. Ready to hang. The painting is in good co ndition. Age:The work is from 1960-70. Karl Thygesen Gallery. Delays can occur du to custom and security check. Condition: ( imperfections / defects - see pictures first): oil color loss and scratches due to age. This listing is for a single vintage print from John Marin's body of work. It is of a watercolor titled Lower Manhattan from the River, No. I. ►Condition: This is a vintage print in like new condition. It has been kept in the original packaging since printing & distribution, away from light. No bends, tears, discoloration, or other issues. It will be shipped rolled in a wide tube. ►Shipping: Additional rolled paper items SHIP FOR FREE. Applies to domestic and international orders. ►Related: This store has several other John Marin prints from the same collection available, as well as a set of 5 prints. See the full description for links..
Oil on cardboard. Signature verso. Size:35x45cm (13 1/2x18 in ). Born in Elizavetograd region. In 1950 he graduated from Kharkiv Institute of Art. He studied under the guidance of M. Deregus and O.Kokel. Very good condition. Martensen studied at Pennsylvania Academy of the Fine Arts and the Vermont Studio Center. Framed Signed Print Watercolor Cecile R Johnson Woodstock Winter Snow Framed. Shipped with USPS Priority Mail. Has signature, not sure if it is hand signed or printed. Still a beautiful painting, framed. Frame has some light dings. I believe it is from the 60s. Measures 21.5” x 17.5” in frame. Artwork is 14.5” x 10.5”. Will be packaged safely and shipped quickly! I bought one of these for 150 with some foxing a year ago. Recently came across a few of these at an estate sale. The price is very good given that this a never, framed, artist signed print in absolutely perfect condition. This etching depicts an old-school Chris Craft Wood Boat on Lake Michigan with the Northwestern Campus in Evanston in the background. Perfect gift for any graduate of Northwestern or lover of Boating on Lake Michigan. The style is very similar to many WPA era prints. Some might consider the style regionalism or ashcan as well. Print is facsimile signed, M. Martin which I believe is Margaret Martin. The lithograph is not dated, but could be anywhere from the 1940s to 1960s. The back is yellowed from age and is NOT acid free, of course. Oil on cardboard. Signature verso. Size:35x50cm (13 1/2x19 1/2 in ). Born in Elizavetograd region. In 1950 he graduated from Kharkiv Institute of Art. He studied under the guidance of M. Deregus and O.Kokel.